I use the portuguese translation and I notice that there is an error message which is not translated, it is hard coded in the js file. While in table vision and have not configured the measures, I click on any type of chart and get this message in English. Could you implement the translation using the pr json file, please? Also, it’d be nice if there where an explanation on how to define the measures on the columns menu. This way I would reduce the number of ticktes my final client opens to me asking why the message is displayed. Hi. 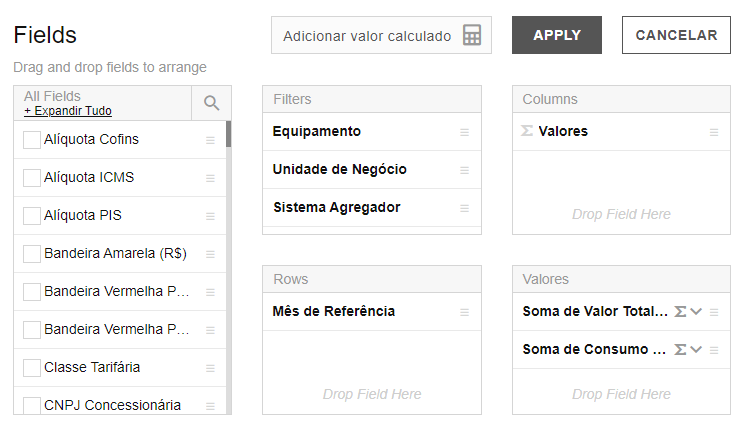 I use the Portuguese translation as well, and I’ve noticed the same problem that Marina has reported and also I’ve noticed that there are many other words not translated, such as ‘filters’, ‘columns’, ‘rows’, ‘Drop field here’, ‘Apply’, Drag and drop fields to arrange’ and other. You can see the example in the attachment. As mentioned above, the issue with the message “no measures to display” will be fixed soon. These words are translated here. I’m glad to inform you that the issue with the message “no measures to display” has been fixed and the updated version with the fix has already been released.